Initially, I was planning to read the books borrowed from library about natural dye, but I didn't get enough time to do so. In the end, I found some instructions online. It is not ideal, because the books tell more. But on the good side, I know where to find information if I want to go further in the future. 4. If the fixing is for fruit, then put 1/4 cup of salt and 4 cups of water. If it is for vegetable, then use a cup of white vinegar and 4 cups of water. 5. 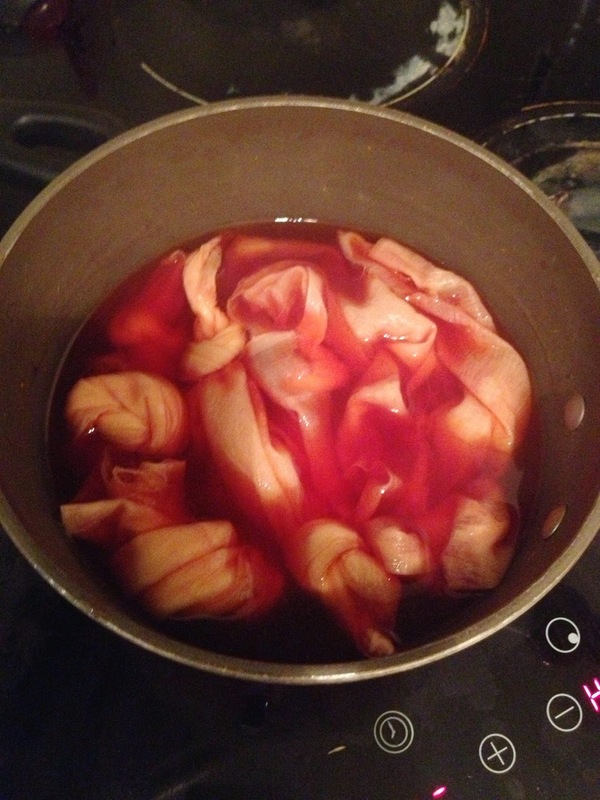 Boil the fixing, then simmer the fabric in the fixing for 1 hour. 6. 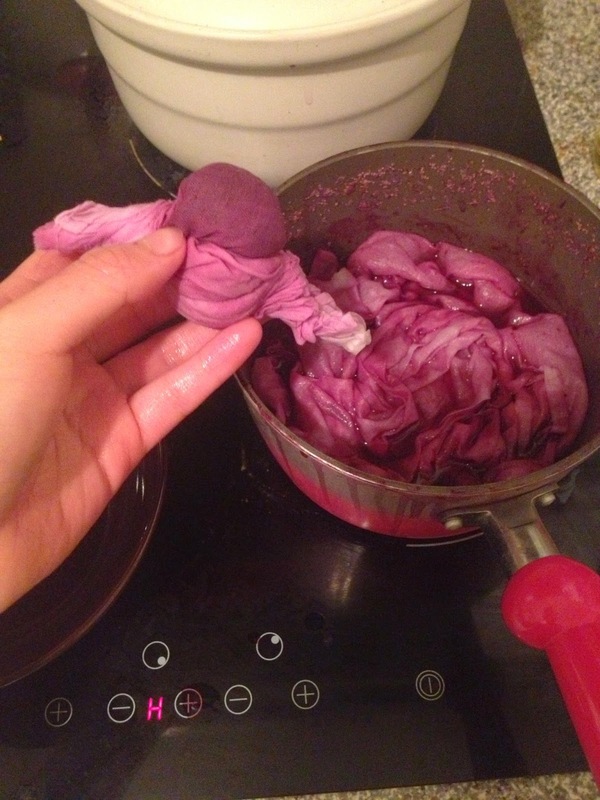 Rinse the fabric in cold water, then soak it in the natural dye until wanted colours showing. Since I didn't have the white vinegar when we did the first text, we used juice squeezed from 1 lemon instead. The colour is almost invisible, with very light yellowish green. It might because of the lack of spinach and the way of fixing. I will fix this in the next time. The colours were not pink after rinsing. 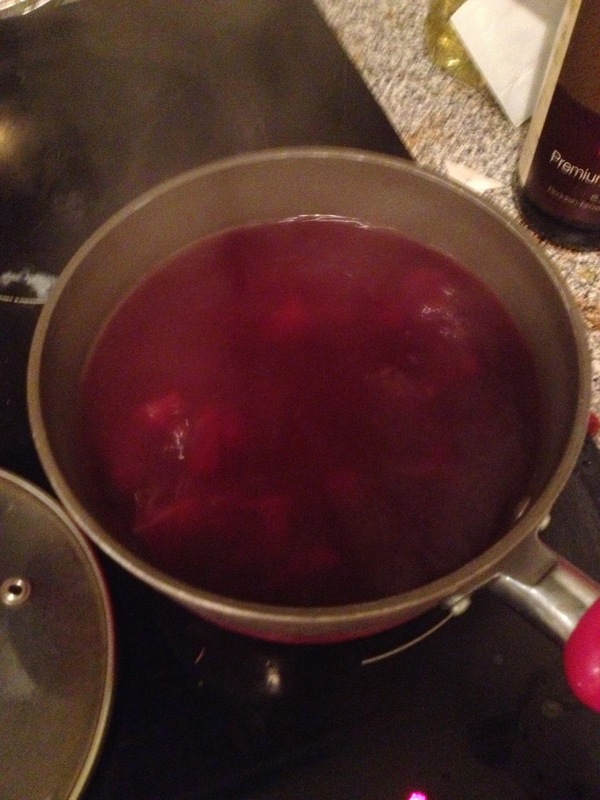 Perhaps one beet root was not enough, and the lemon juice was not as powerful as vinegar. 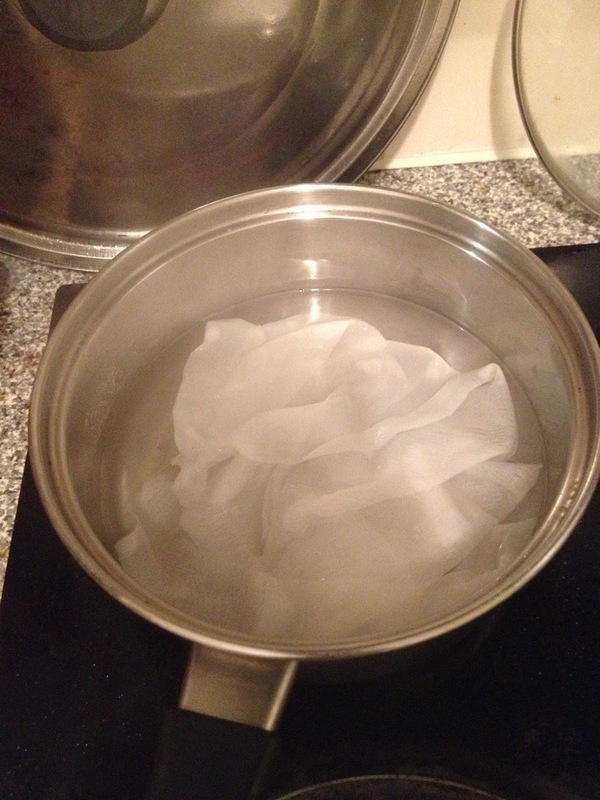 Cotton bought from CAM, fixed in salt water (as in the instruction) for 1h. The left one was the fabric I used to wrap and squeezed the berries. Since it was not completely dyed in the solution for enough time, the colour is lighter, bluish and uneven. 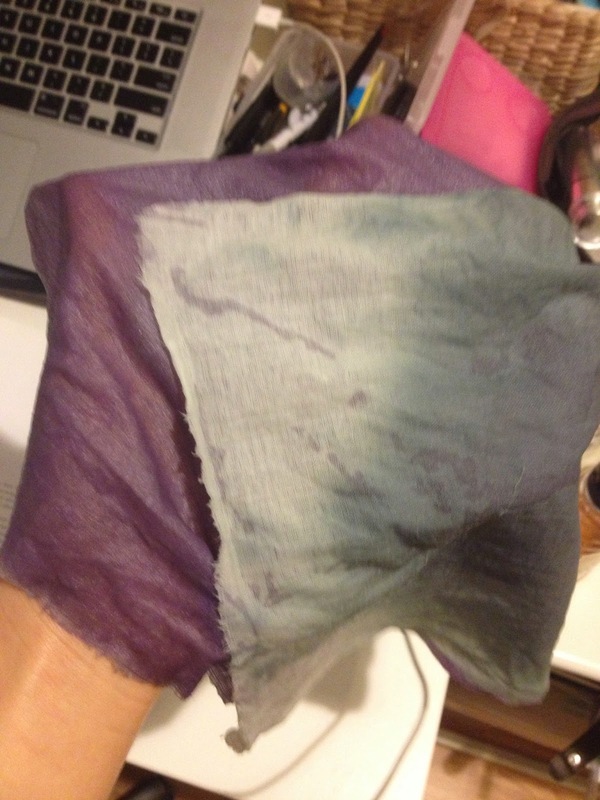 The purple has been dyed for 1 hour. 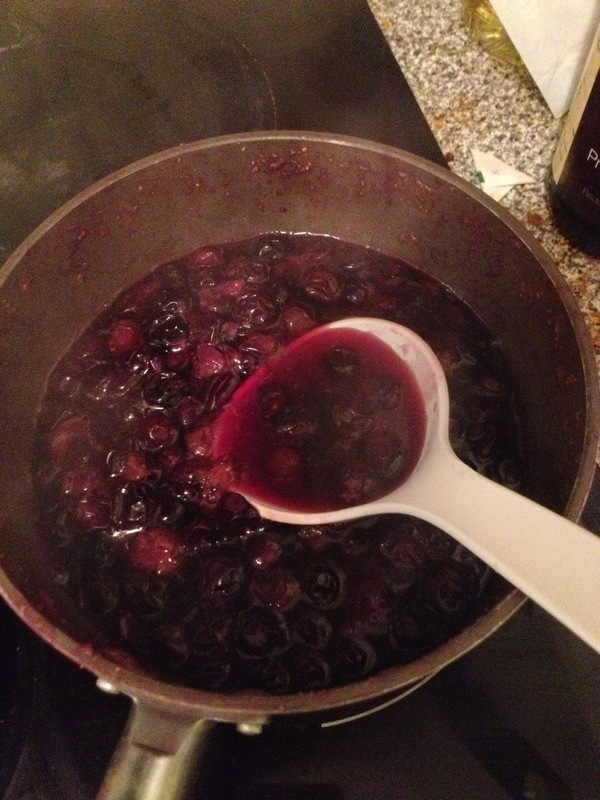 It seems the longer you dye and more the berries are used, the more purple the fabric will be. The colour looked more vivid when the fabric were still wet. Even the colour paled a bit, these two samples were most successful in my first group of test. It was fun to work with food. The kitchen was filled with sweet fruit smell. 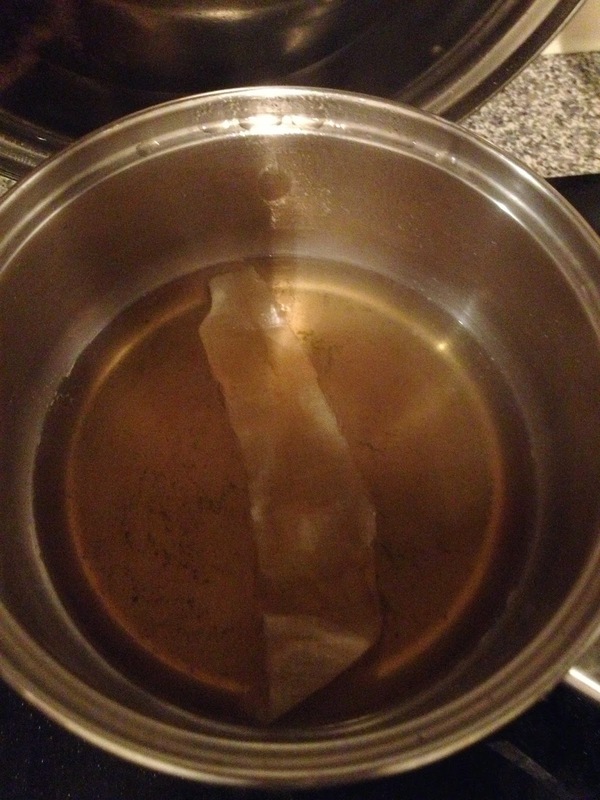 At the same time, I should record the amount of the ingredient more accurately, as a guide for potential improvements.